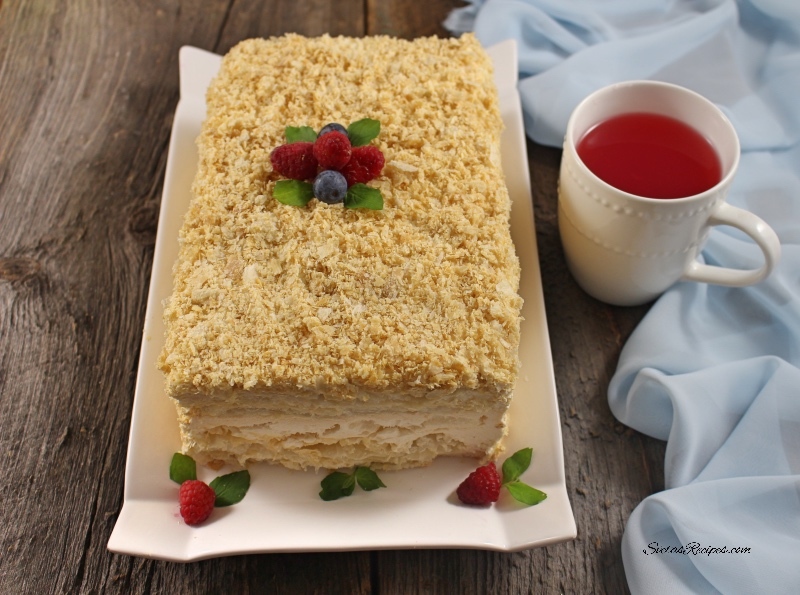 This cake recipe is one of my family’s favorites. I make it for all types of holiday and my kids and grandkids love it very much. It is easy to make and its so soft and fluffy. I personally love it because its one of the few cakes the melts in your mouth. Take 2 sheets of french puff pastry dough and divide each of them into 3 pieces. 4 of the pieces should be the bigger pieces used for the cake 10×6. The smaller 2 pieces will be used for the crumbs for the decoration of the top and the sides of the cake. Place the dough pieces onto baking sheets and bake for 20 min at 400 F. After the dough is baked let it cool down and divide each of the 4 10×6 pieces horizontally as shown in the picture above. ( you will end up with 8 pieces ) Your end result will be two small cakes. 2. Pour heavy cream/teaspoon of cream cheese (room temperature) into the mixer bowl and let it mix on medium until the mixture starts turning fluffy. 3. After add Dulche tde Lecho to the mixture and mix well . 4. Your cream for the cake is made now take it out from the mixer bowl and place it all into a separate bowl because we will be using the mixer for something else. 5) Add egg whites / a bit of lemon juice into the mixer bowl and mix at high speed until soft peaks form. 6) Add sugar and beat well until it is completely dissolved. The whites should stand in stiff glossy peaks. 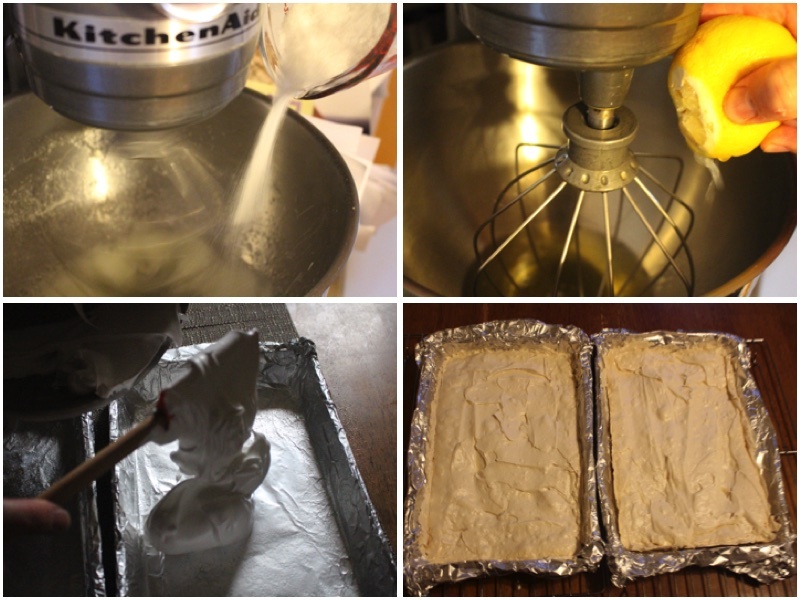 7) Take 2 baking sheet 10×6 inches and cover with foil paper. Spray both with stick resistance spray and then divide the mixture and spread it nice and evenly throughout both of the baking sheets and bake for 30 minutes at 250 F. After 30 minutes pass we turn down the temperature to 200 F and bake for additional 2 hours. 8) Take 2 pieces of the french pastry dough and place them parallel to each other and cover each of them with cream. Then take 2 sheets of meringue and place on top of each of them. Then we cover each of them with another layer of cream and place another sheet of french pastry dough and then repeat. On each of the cakes you should end up with 3 sheets of french pastry dough and 1 sheet of meringue. The extra 2 pieces and the small pieces we crush and use to decorate the top and the sides of the cake. This cake recipe is one of my family's favorites. I make it for all types of holiday and my kids and grandkids love it very much. It is easy to make and its so soft and fluffy. I personally love it because its one of the few cakes the melts in your mouth. 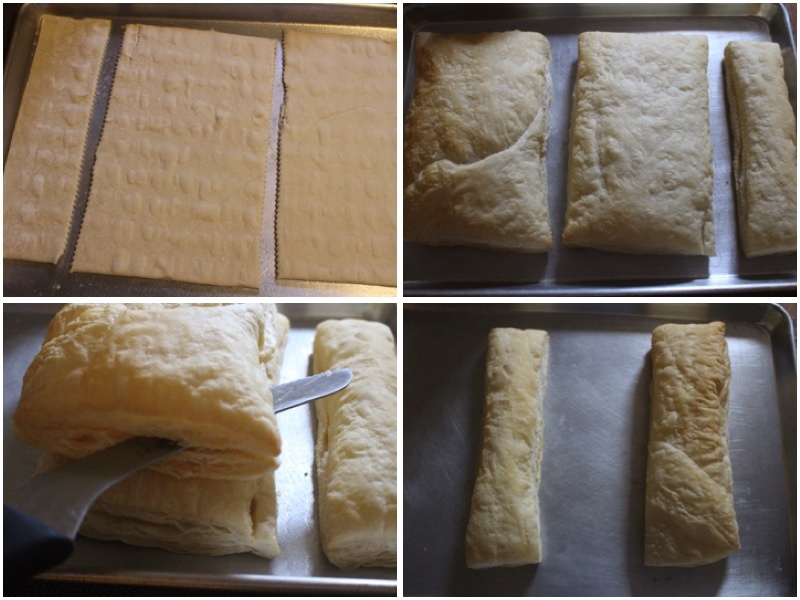 Take 2 sheets of french puff pastry dough and divide each of them into 3 pieces. 4 of the pieces should be the bigger pieces used for the cake 10x6. The smaller 2 pieces will be used for the crumbs for the decoration of the top and the sides of the cake. Place the dough pieces onto baking sheets and bake for 20 min at 400 F. After the dough is baked let it cool down and divide each of the 4 10x6 pieces horizontally as shown in the picture above. ( you will end up with 8 pieces ) Your end result will be two small cakes. Pour heavy cream/teaspoon of cream cheese (room temperature) into the mixer bowl and let it mix on medium until the mixture starts turning fluffy. After add Dulche tde Lecho to the mixture and mix well . Your cream for the cake is made now take it out from the mixer bowl and place it all into a separate bowl because we will be using the mixer for something else. 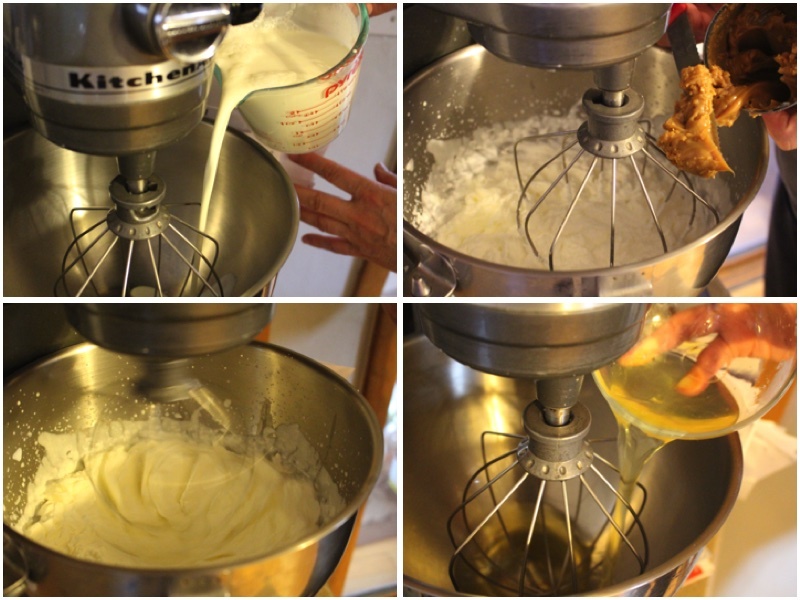 Add egg whites / a bit of lemon juice into the mixer bowl and mix at high speed until soft peaks form. Add sugar and beat well until it is completely dissolved. The whites should stand in stiff glossy peaks. Take 2 baking sheet 10x6 inches and cover with foil paper. Spray both with stick resistance spray and then divide the mixture and spread it nice and evenly throughout both of the baking sheets and bake for 30 minutes at 250 F. After 30 minutes pass we turn down the temperature to 200 F and bake for additional 2 hours.
) 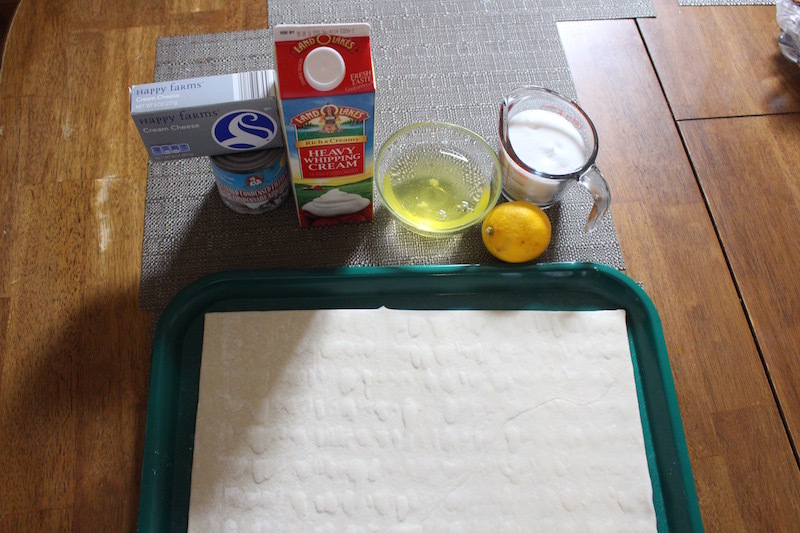 Take 2 pieces of the french pastry dough and place them parallel to each other and cover each of them with cream. Then take 2 sheets of meringue and place on top of each of them. Then we cover each of them with another layer of cream and place another sheet of french pastry dough and then repeat. 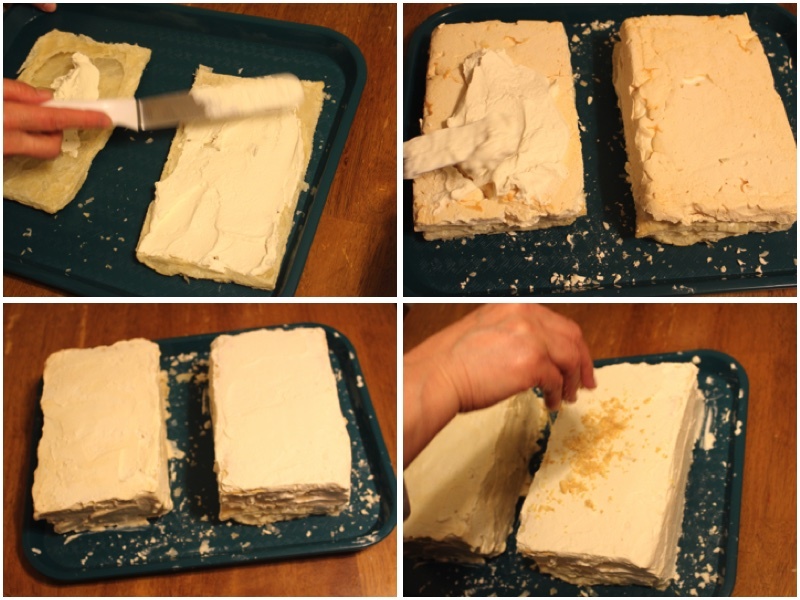 On each of the cakes you should end up with 3 sheets of french pastry dough and 1 sheet of meringue. The extra 2 pieces and the small pieces we crush and use to decorate the top and the sides of the cake. Yes you can add any fruits you would like!